Ask Hackaday: Whatever Happened to Wire Wrapping? Back in the 70s when I started getting interested in electronics, tons of magazines catered to the hobbyist market. Popular Electronics was my favorite, and I think I remember the advertisements more than anything, probably because they outnumbered articles by a large margin. Looking back, it seemed like a lot of ad space was sold to companies hawking the tools and materials needed for wire wrapping, which was very popular for prototyping in the days before solderless breadboards were readily available. I remember beauty shots of neat rows of small, gold posts, with stripped wires wrapped evenly around them. To the budding hobbyist, wire wrapping looked like the skill to have. With a huge selection of posts, terminals, and sockets for ICs and discrete components, as well as a wide range of manual and powered wrapping tools, it seemed like you could build anything with wire wrapping. But fast forward just a decade or so, and wire wrapping seemed to drop out of favor. And today — well, does anyone even wire wrap anymore? This drill press was built to drill through-hole printed circuit boards. [Rhys Goodwin] didn’t want to shell out for new equipment, so he dug through his scraps to see what he could accomplish. He already had the power drill, and there was no shortage of wood and fasteners. Once he had a mounting platform for the power tool he grabbed a pair of slides from and old rack-mount server rail. This provides smooth and precise movement, along with a tension sprint to keep the rig elevated above the work surface. Turns out the only thing he didn’t already have was the mini-chuck for gripping the 0.8 mm drill bit. It seems as if [Rhys] is hacking up a storm lately. This drill press is for use with his Inkjet/Toner PCB process from two weeks ago. We also covered his bulk component salvaging system in Sunday’s Links post. We’re not sure how we missed [Jack Eisenmann’s] 4 bit TTL CPU when we were tipped off the first time, but we’re glad it was sent in again for us to feature it. 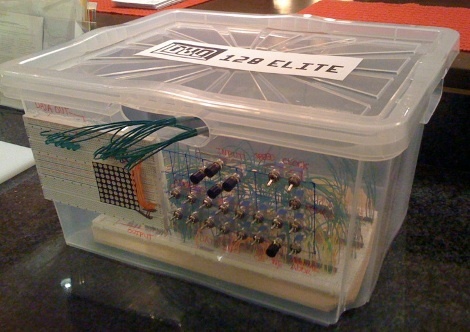 41 different ICs (mostly TTL) come together to comprise the DUO 128 Elite. While the architecture is a little different than what we’ve seen before, using “nyckles”, the DUO 128 Elite still works perfectly. Catch a video of some example programs, including pong, after the divide. 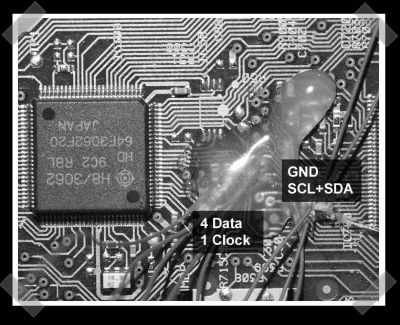 If you are curious about reading all the bits on a DVD, [tmbinc] has devised a hardware hack that uses a Pioneer DVD drive with leads soldered onto it and a Cypress FX2 microcontroller board to grab the flow of bits and push them over USB2.0. My favorite part of this tutorial is when you slow the spinning DVD down very slightly with your finger with a scope hooked up over what you believe to be the raw data stream from the disk. If the data rate slows when you physically slow down the disk, you probably are grabbing data from the correct pin. [tmbinc] even put together a software tool to process the resulting raw DVD data.